We have teamed up again with our friends at the Animal Rescue League of Iowa for the charity of choice for the Leprechaun Chase 10K Des Moines. Over $18,000 has been raised for ARL through the event since 2013. The following is a blog post from ARL about how you can adopt a pet or get involved. St. Patrick’s Day. A day that honors the patron saint of Ireland – an international festival to celebrate with green parades, green clothes, green beer, and of course, the incredible Leprechaun Chase 10K. But for Chica, Patches, Nola, Zach, Badger, and hundreds of other animals – it’s just another day in the shelter, wishing and wondering if today will be their lucky day. These animals wait days, weeks, and sometimes even months for the day that a family will fall in love with them, accept them for who they are, and take them home to live a new wonderful life. 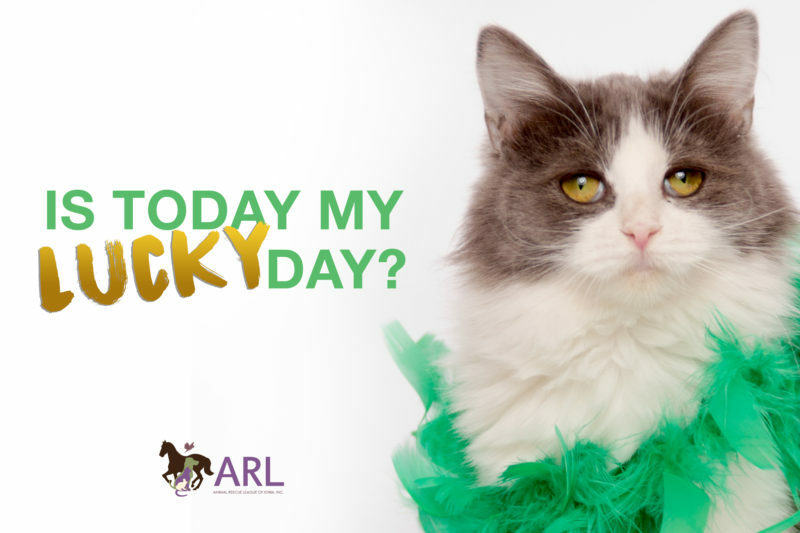 So as we’re celebrating this 10K-running-green-beer-drinking-holiday, we encourage you to follow the rainbow to the ARL or your local animal shelter and make today the lucky day for one of these animals. Whether you need a running buddy or more love in your home, adopting an animal just might make YOU one of the luckiest in the land. The Animal Rescue League of Iowa (ARL) is honored to have been chosen as the charity of choice for the 2017 Leprechaun Chase 10K! We thank you for your donations and support, which enables us to continue our mission to promote animal welfare, strengthen the human-animal bond, and prevent the overpopulation of pets. The ARL will be at the finish line of the Des Moines Leprechaun Chase, so please stop by to learn how you can get involved with the ARL’s Running Club and Paws on the Pavement program!